The menisci in the knee are a common site of injury and irritation, resulting in pain and loss of function. Tears are common in the meniscus and one approach is to have keyhole surgery to have the tear repaired or removed. Surgery involves minimal disruption of the cartilage and preservation of the existing cartilage tissue. The evidence suggests a rethinking on the management of meniscal tears. I provide a brief report on my thoughts from clinical experience and the evidence on meniscus injuries and their management. A meniscal injury is a very common injury of the knee, usually resulting from an intrinsic or extrinsic component. A sudden change of direction or a tackle usually when the foot is planted or if you sustain a fall such as in skiing or even an accidental trip or slip can cause disruption to the meniscus. These types of mechanisms of injury can and are often associated with other injuries including a cruciate ligament or medial or lateral ligament injury. A meniscus can become degenerative; wrinkly like our skin either through natural aging or as a result of a previous knee injury where other tissue may have been disrupted in early adulthood. Let’s take a look at the anatomy of the meniscus in the knee. The above picture shows the lunar shaped medial and lateral meniscus from an above view. The lateral meniscus is more circular shaped and the medial new moon shaped. 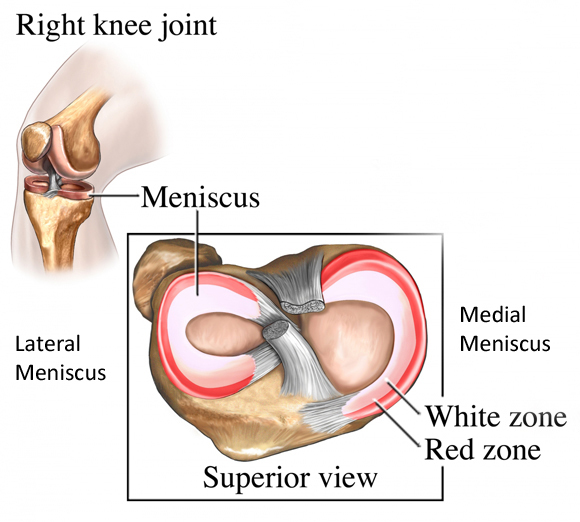 It also highlights two zones within the meniscus the red zone and the white zone. The meniscus is commonly split into three – an outer, middle and inner zone. The outer zone (represented as the red zone in the picture) has a vascular supply, the middle and inner zones (white zone) are avascular (no blood supply). The inner zone receives its nutrition through compression and diffusion from the synovial fluid very much like hyaline cartilage located on the bone ends (reference). The lateral meniscus is more mobile than the fixed medial meniscus this is to maintain congruency with the small amount of rotation that the joint has through flexion and extension (reference, reference). Shock absorption – This is questionable as a recent journal highlighted evidence is inconclusive regarding the meniscus as a shock absorber (reference). Bucket handle tear – This is the most common type of tear. This involves a longitudinal tear that spans the length of the meniscus – feelings of locking and giving way are reported with this type of tear. I mentioned earlier that an injury can occur in the meniscus usually as a result of twisting with a planted foot or if the knee is under some form of load. This can occur as a result of a fall, say whilst skiing, or something as simple as a trip, ladies in high heels be careful! A tear could also occur from a sudden change in direction if playing a sport, such as tennis or volleyball. Contact sports such as Rugby and football are also high up on the list for sustaining a meniscal tear. However (courtesy of @adammeakins) the following chart shows that meniscal injuries can be completely asymptomatic (painfree). So what are the common characteristics of a meniscus tear? Small tear – this may cause no immediate symptoms but you may begin to notice an increase in pain and swelling over a 24-48 hour period, you may notice pain is only apparent at the ends of range of motion. Small tears are best managed conservatively. Moderate tear – Will show the same signs as a small tear but you may notice stiffness and tenderness, your range of movement may be more painful through range. Severe tear – Again you may experience all the signs and symptoms of a small and moderate tear but they tend to manifest quicker. You may also experience locking of the knee and giving way of the knee. There are a barrage of tests for the meniscus, all have been researched extensively and all have relatively low specificity and high sensitivity. Put simply, this means that the tests can be painful but in terms of the tests actually identifying the meniscus as the source of symptoms it’s a bit of a grey area. Common tests used and that have been researched extensively are McMurrays and Thessaly tests. Joint line tenderness has also been identified as a diagnostic tool, evidence is mixed dependent on the association with other pathology thus reliability is low to moderate (reference, reference). 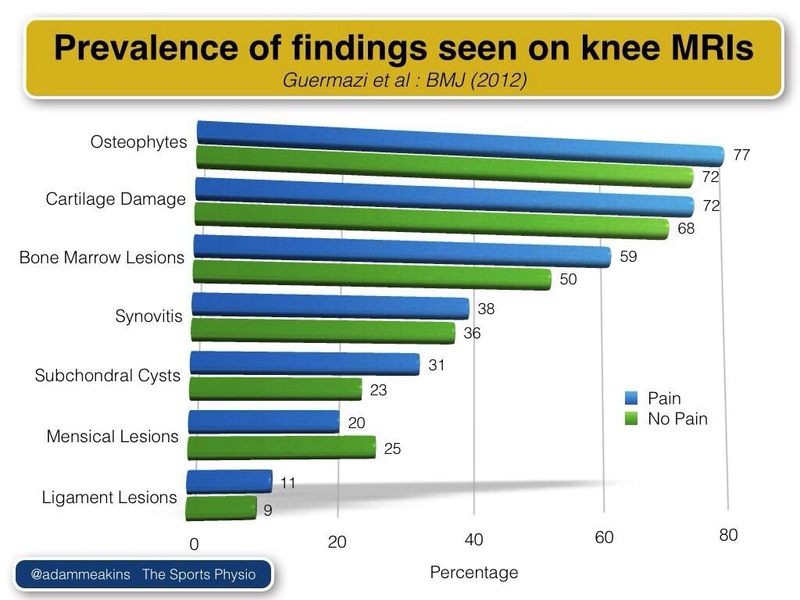 Therefore a combination of tests tends to provide a better predictor for meniscal pathology (reference). I will not solely rely on clinical testing to determine a meniscal tear, I aim to establish a hypothesis of thinking from a comprehensive history prior to an examination. 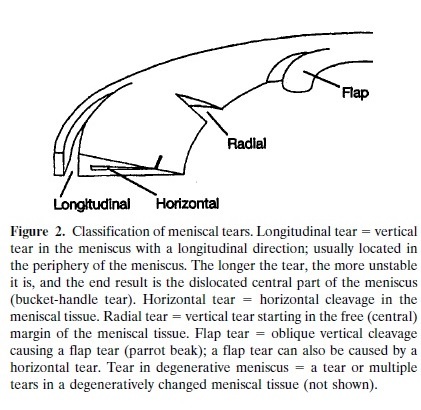 Management of meniscal tears does depend on the degree of the tear. If you are experiencing locking and pain then a referral to an orthopaedic specialist is the recommended option. Surgery really is a last resort when it comes to meniscal injuries as we don’t want to be unnecessarily removing important structures from our knee if we don’t have to. Meniscectomy was a popular surgical procedure in the late 90s however it became evident that menisectomy and developing early onset of Osteoarthritis in the knee were linked (reference, reference). Understanding the biological make up of the meniscus has disseminated an alternative approaches to meniscal rehabilitaton. Clinical identification of the size of tear can help with determining what approach is required. Where surgical approaches are recognised as an appropriate treatment option for severe tears, conservative management is a preferred option to meniscal injuries of a degenerative nature (reference, reference). So what constitutes a degenerative meniscus? Well the jury is out on this as it is evident that a meniscal tear can be in the presence of a degenerative meniscus and that a degenerative meniscus is associated with osteoarthritis, which can be associated with pain. So how can you identify which is the driver of a patients pain?? It is difficult to determine if the tear is the cause of ongoing symptoms. Therefore is a surgical approach for degenerative meniscus really indicated? (reference) Now this sounds like a broad statement to make and other’s reading this may utter the words BS yet the literature suggests a chicken or egg scenario regarding pathology and pain relationships. So conservative management would include identifying the location of pain in the knee through range of movement, commonly at the extreme ends of range, examining muscle tone and spasm around the knee, assessing proprioceptive/motor control and determing muscle strength deficits. The menisci have muscle and ligamentous attachment and have a neurovascular supply, which can be a nociceptive input for pain. Let’s not forget the central nervous system in all of this and the context of the meniscal injury. It is important to obtain a comprehensive understanding of our beliefs and behaviors towards any injury. Our thoughts are particularly powerful when it comes to experiencing persistent pain. Treatment would include reduction of associated muscle tone and guarding, restoration of muscle strength deficits and progression to functional and proprioceptive control exercises. A program would also include gradual increase in load tolerances and force/shock dissipation through muscular control. Addressing the entire kinetic chain(trunk, hip, knee and ankle) whilst working through rehabilitation progressions. It is important that a sound clinical history is taken when suspecting a meniscal injury and understanding the clinical signs of a meniscal tear with a sound knowledge of the evidence base will help to provide appropriate management and avoid unnecessary referral. In contrast the basis of the assessment will also determine whether a referral to a specialist is indicated. We don’t need to be needlessly whipping things out of knees if we don’t have to. Next Achilles Heel: Perhaps it was tendinopathy?